The Coral have released one of the albums of the year with their latest album Move Through the Dawn, released via Ignition Records. 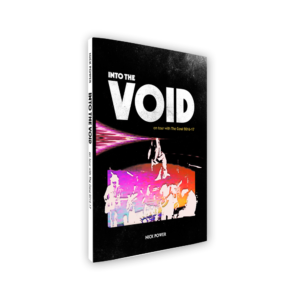 Accompanying the release is keyboard player Nick Power’s book Into The Void released via Erbacce Press, which covers the bands on tour antics between 2016-2017. Matt Mead reviews the book for Louder Than War. Move Through The Dawn is one of the most refreshing and exciting new albums I have heard in many a year. Whilst I was on holiday in Cornwall with my family this year, the album was the soundtrack to our adventures as we travelled through the narrow country roads, whilst the sun blazed away and was the perfect companion to our summer exploits. As I was highly entertained by the music of The Coral, equal to the soundwave joys is the excitement and humour I was met with whilst reading Nick’s book, Into The Void. Nick comes across as a natural, engaging story teller and his writing comes across as affectionate, humorous and appealing. From the opening chapter you’d find Nick telling tales of the bands travels around the world playing to the masses plus what they got up to in TV and Radio studios promoting their then album, Distance Inbetween, plus their studio and rehearsal regime. Each chapter is fairly short, not going into pages and pages of endless boring dialog, rather Nick keeps things short and sweet, detailing the geographic location of each chapter with enough detail to get the mind picturing his regular misdemeanours and what the band get up to on a daily basis. Details of appearances on BBC Breakfast, in session at BBC 6 music plus the bands feature film favourites, DJ set lists and Paul Simon’s vampire fingers, it’s all in here! Overall, a highly entertaining book, which is a mighty fine companion to the band’s stunning new album. The book and album can be purchased from The Coral’s website.